This is one piece out of 3-piece custom order. It has it's own story of creation... I won't tell all of it, just mention that it took lots of stone-hunting and design-developing. Of couse (as always) the picture does not show the real beauty of this 3-D piece with lots of colours and textures. These earrings are made for the same person who ordered the Amolite pendant. It was an intersting order: interesting person, interesting dicussion and interesting result. I am very happy. This necklace features a nice picture jasper. 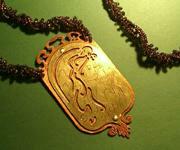 This nature created landscape is accented by the hand engraved silver plates. The design is created according to my customer's idea. I got two stones for a custom work... And a very specific task: "Surprise me!" This is the order that I've gotten before Christmas from the same lady whom I made the surprise orders for. She really liked her previous pendants. This is a "dogtag" pendant for my husband's birthday. It is made of nickel silver (as he has lost one before... so no sterling silver for him!) 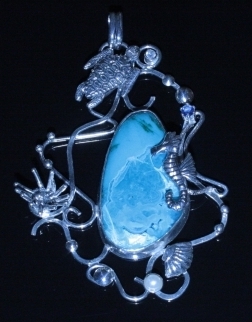 Reconstructed red coral is shaped by a lapidary artist Bruce McLellan for this project. Coral diamonds are held by cold white enamel. I knew that this order was coming a couple of months ahead. We were just waiting for this nice big blue topaz. It was a challenging job, but very exciting! This order came unexpectedly. 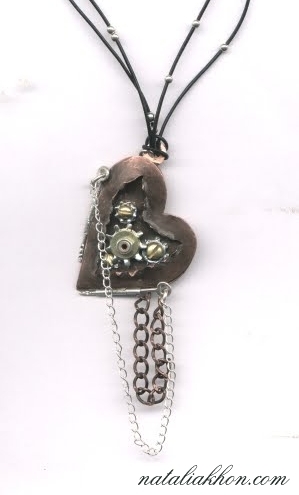 A customer brought a ring and wanted to have a locket made to mach the ringвЂ™s design. 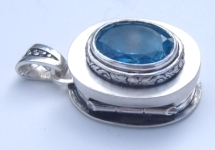 He chose a stone that replicated the shape of the stone in the ringвЂ¦ I realized that the locket needed to be quite bigвЂ¦ Though all other design decisions were left for me and I could use all the creativity I wished. This was a custom made Christmas decoration. Little baby girl used to draw this funny creature. 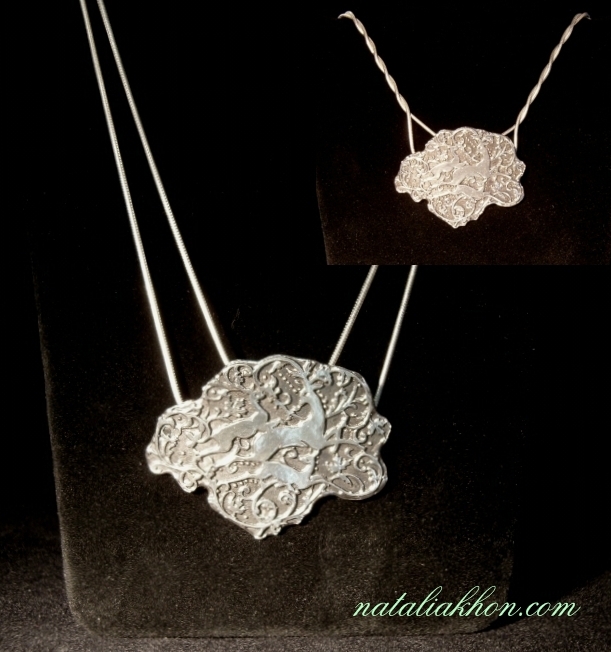 When she grew up her mom brought one of her pictures to me and asked to make it in silver. Most of labradorite stones come from Madagascar nowadays. This one is from Labrador, the area that gave the name to the stone. 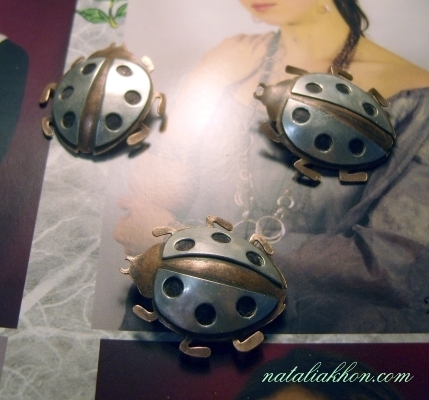 Some times I make jewellery for my personal "not-for-sale"collection. 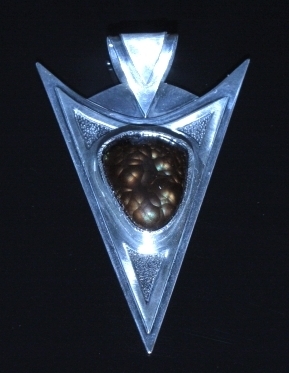 This pendant is one of those pieces. 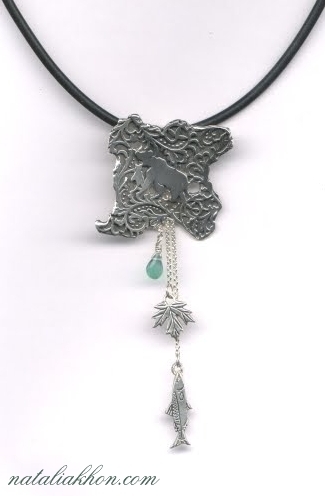 When a friend of mine saw this deer piece, she had her own idea on how it should be attached to a necklace. I am happy to see that she wears it sometimes. British Columbia bracelet. Sterling silver. That was a very beautiful and sad story... As any artist, I was very glad to be commissioned to make pieces with a special meaning. 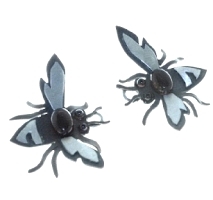 The brooches were designed by the customer and cannot be duplicated. 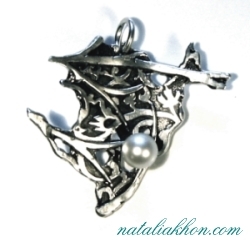 Sterling silver pendant with a pearl. She asked my opinion on a metaphysical subject... What if she liked amethyst, though the books told it was not her stone? I am no expert... I only know that many people say, that if a stone attracts you, it means that stone is yours no matter what the books say. "Oh, then could you make me a beaded bracelet with amethyst?" - She asked. 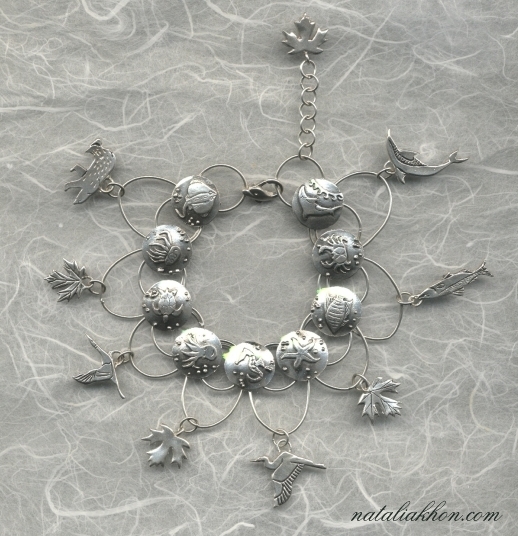 The base for the bracelet is my original design that she has found in my web site. She needed really to dig it out to find it! She was really happy when she received it. It made me happy too! 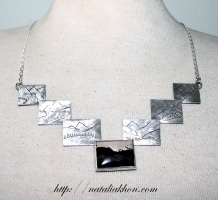 This was another piece that I designed specifically for a lady I knew. I kept in mind her profession and tried to make a piece that she would be able to wear either to work or out. Therefore the charms are removable. This is my official first custom order in metal. We had a fun project called вЂњA gift for a friendвЂќ. We wrote our names on pieces of paper. Whoever name you get then you make that person a gift. You need to interview them, but make somewhat a surprise. Unbelievably enough I got my real friendвЂ™s name at that time. When I went back to Russia for Christmas, I met my old good friend. The first time in her life she was into pink colour. Not having any tools on me I could use the seed beads only.